Learning to play well with others is lifelong skill children learn in early childhood. Toddlers and preschoolers are learning how to express their needs, wants and preferences while accommodating a friend’s needs, wants and preferences. Sometimes, children’s play-styles blend easily; other times it takes a little work – just like grown-ups. With practice, children’s interactions progress from peaceful co-existence to complex interactions according to mutually agreeable rules. Conflicts begin when 18-month-olds discover the power of ownership with the words “no” and “mine”. Two year olds often initiate a protective offensive when they sense another child looking at their toy, anticipating the worst. Three year olds “know” social rules like share, take turns, or use your words but best intentions go awry when frustration and emotions take hold of them. Aggressive behavior is unacceptable but it is predictable as social interactions increase. 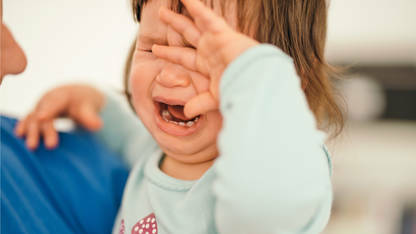 Young children must learn critical social skills to prevent and resolve social disputes. Here are a few helpful strategies to use when your child encounters age-appropriate social conflict. If the acts of aggression are mild, do not make it a discipline moment with your child. • Casually redirect the children by putting all your attention into creating a more positive play experience. Model more appropriate choices with phrases like “I think it’s time to play something new….” Stay in the play until the new focus sticks. • Be sure to talk to the other child’s parent ahead of time. Let that parent know you are aware of the aggressive behavior and you will be involved to prevent any further aggression. If the exchanges start to get a little rougher or you notice that the other child is feeling troubled, you need to be more hands-on. • First, watch how the offended child responds. If he is communicating for himself, make sure the aggressor is “listening” by saying something like “He’s telling you to stop. He doesn’t like that”. • Discreetly shadow your child to prevent your child from hurting again. This is critical for hitting, pinching, and especially biting. The only way to stop those behaviors is to intercept the child before the behavior occurs. • Continue for weeks, if not months, until this stage in your child’s life has passed. Be ready with Plan B for those occasions when your child is quicker than you are. • First, state firmly but without theatrics that “I will not let you hurt your friends”. • Second, focus your attention on the child that’s been hurt. Offer comfort, tend to wounds, model descriptive language (“that hurts”, “you don’t like being pushed”, “you aren’t finished playing with that toy”). • And lastly, remove your child from the situation either by taking a short break from the group or by leaving the play group altogether. This last point must be made with firmness but without anger. Anger is counterproductive because children become fearful and you lose the teachable moment. You are asking your child to show an enormous amount of self-control and now you have the opportunity to demonstrate calm and clarity. Do not ask your child to say she’s sorry. She isn’t feeling sorry right now. You should say you are sorry because you are sorry that the other child got hurt. Believe it or not, children learn more compassion by watching caring adults than by being forced to say something they don’t want to say or something they learn to say without feeling. This is also the time when you realize that your parenting solutions may be very different from other parents. You are now involved in parent-to-parent compromises. It takes honest communication to work through parenting disagreements but may be worth it to save a friendship with another adult. It may also be an option let your child take a break from another child for a short period of time. Lastly, do not treat anyone like a “victim”. Teach the child who gets hurt how to use a very big voice to say “No, don’t hurt me!” With a little compassion, we can turn this lose-lose situation into a win for everyone!